Bedfordshire have yet to win a game and have lost their previous four matches by between 120 and 480 points. Climbing off the bottom of the table therefore looks a very big ask – they’d need to beat the ‘shells by over 350 points – but they will be keen to at least get a victory on the board in this final game. The Bombshells currently place 294th in Europe on Flattrackstats with 469.2 ranking points, with Beds 351st on 432.2. Splitting the difference between home team predictions on FTS (as they don’t have an option for a neutral venue such as this) sees Eastbourne given an 80% chance of taking the win. Expected points differential of around 10:7 would equate to something like a 250-175 Bombshells win. If any game is going to have a major effect on the final placings it’s likely to be this one. What divides these two teams is essentially their respective performances against the Bombshells, with Norfolk’s victory accounting for the extra three points (and better score differential) they hold over the Hell’s Belles who Eastbourne beat. The points gap is narrow enough that Hertfordshire only need to win by 67 to take third place from the Brawds. Conversely, if the Belles lose and Bombshells win, the Herts side will drop below Eastbourne in the table. So no team has more to gain or more to lose on Sunday than Hell’s Belles. The rankings are in their favour, with Herts placed 166th in Europe (519.1 points) and Norfolk 181st (513.6). There’s not much in it, but the Flattrackstats predictor, adjusted for neutral venue, calls this as a 55% win probability for Herts, with a predicted differential of 50:47, which is equivalent to a squeaky tight 200-188 Belles win. 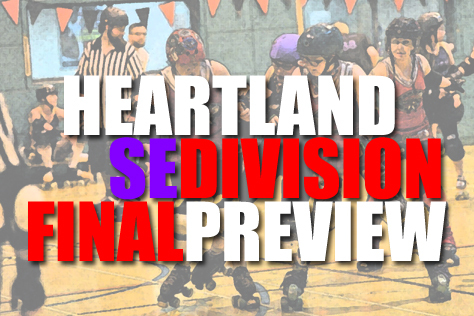 Your most recent Heartland Series game (against Big Bucks) resulted in a fairly heavy defeat. Was that expected, given the strength of the Wycombe side? We went into that game knowing that it would be tough and so we were aiming to just minimise the score differential. Big Bucks are ranked much higher than us and were expected to beat us by a lot, but we actually did slightly better than the score prediction from Flattrackstats’ European rankings. We’ve had a few difficult games now in the Heartland Series and we’ve learned to focus on our blocking and strong walls rather than on jamming. Unfortunately in the game against Big Bucks we lost another player to injury (Beast Unleashed broke her ankle) so we’ve had to change our line-ups around for this weekend’s game. You’re returning to Big Bucks’ Wycombe venue on Sunday for the final day of South East division games. 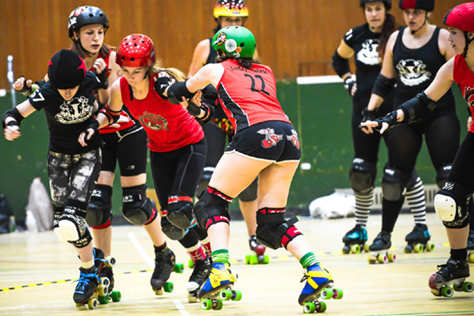 Do you know much about your opponents, Bedfordshire RollerGirls? We’ve seen them play a few times now in the Heartland Series. Booty Vicious is Bedfordshire’s player to watch out for. She’s a strong blocker and a big hitter. She occasionally jams and is very good at powering her way through walls. I would liken her to the Bombshells’ Smash’er Fierce – a strong blocker who can hold walls together and send the jammer flying. Any Bombshells players or tactics people in the crowd should keep an eye out for? How do you expect the game to go? Care to predict the result? According to the online predictor the Bombshells should win. However, we were predicted to win against Norfolk and we lost that one by a fair amount. There’s been a lot of change in the Bombshells ranks recently, with key players leaving and others injured, so I don’t think that the predictor is entirely accurate. Obviously we hope to win! But I think it’ll be a more even game than our last few matches. Elle Hound is a player to watch out for – she’s now a key part of our jammer rotation. The day’s other games are Hell’s Belles v Norfolk Brawds and Big Bucks v Milton Keynes. How do you think those two games will go? Any particular players people should look out for? 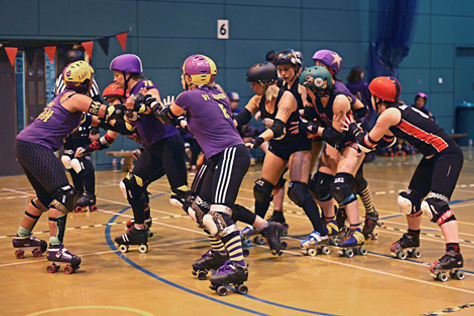 The Hell’s Belles v Norfolk Brawds game will be interesting for us as we really need the Brawds to win. If they do, and if we win our game, then the Bombshells would finish 4th in the division. On the other hand, if Hell’s Belles win, it would come down to points differential and theirs is currently much better than ours. The Belles played really well in their last bout against MK and could surprise everyone. They’ve got some great jammers (especially Dolly Spartan) who will really test the Brawds’ walls. The Bombshells are big Hell’s Belles fans and we have a recent transfer from the Belles playing with us, so we’ll be cheering for them, even though we really need the Brawds to win! I’m really looking forward to the Big Bucks v Milton Keynes game too, and I think it’ll be very close. At the moment I’m unsure as to who will win it. How has your Heartland Series campaign compared to your expectations going into it? What have been the highlights and lowlights so far? I’m not sure we had any expectations going into Heartland – it’s all been very new for us. Coming 4th in our division would be fantastic. For me one of the highs so far was the last jam of our game against Hell’s Belles. It was Swann’s last game with us, so we put her on to jam the final jam of the game and let her choose her ‘dream team’ of blockers so that she could go out on a high. The blockers kept the Hell’s Belles jammer contained and Swann was able to make a quick succession of scoring passes and finish the game on a very high scoring jam. The lows have been the two big injuries in our last two games – Seoul Destroyer broke her elbow in our game against Norfolk, and Beast Unleashed broke her ankle in the game against Big Bucks. Finally, what plans do the Bombshells have going forward? We’re taking part in the British Championships (which the Heartland Series is becoming) next year, but we don’t have much information yet on who we’re playing and when. We have a closed door game against Grid City in January. And of course 2015 will see the return of our outdoor tournament Eastbourne Extreme! The grand final of 2014 Heartland Series takes place on the 23rd November at Newark showground in Nottinghamshire – arguably a more Northern (and Eastern) location that the geographical spread of teams might have suggested. Milton Keynes and Big Bucks go through as the South East’s representatives, alongside teams from Gloucester, Plymouth, Oxford, Cambridge, Hereford and Merseyside. The two SE teams are in separate halves of the draw, so could theoretically meet in the final, though all eight competitors are highly ranked strong sides. Tickets are priced at £10 (plus service fee). See the links below. This year’s Heartland Series has been the biggest and most nationwide yet, featuring 24 teams from across England and Wales, which is quite a jump from what started out in 2012 as a competition for six South Midlands leagues. Next year things get taken to a whole new level. Heartland is being renamed the British Championships and will feature around SEVENTY derby teams from across the UK competing in a football-style pyramid of national, regional and sub-regional divisions. Fixtures are being released to leagues at the moment and should be made publicly available over the coming weeks. 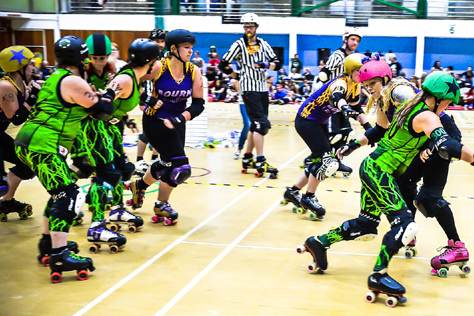 We do know that the Bombshells won’t be the only Sussex participants, with the Brighton Rockers also taking part in next year’s competition. As we understand it, there should be a fair bit of British Championships action taking place at the Dolphin in Haywards Heath in 2015. More info when we have it.